In a retail environment, opening and closing times present unique security risks. At these times, employees are particularly vulnerable to robbery. The following policy can be modified for any retail business that stores cash and valuables such as banks and jewelry stores. 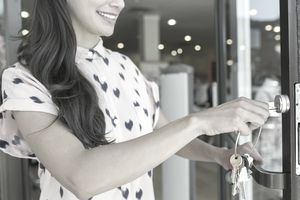 This procedure assumes that the store has an alarm system designed to arm/disarm the premise alarms (motion detectors, door and window contacts,etc.) and burglar alarms (safes, vaults, and other storage containers) separately. The policy can easily be modified to accommodate other alarm system configurations. At least two employees must be present to open the facility. One employee will enter the facility while the other waits outside in a locked vehicle with access to a mobile phone. The outside employee will maintain a clear view of the facility and wait for the predetermined all-clear signal from his/her associate. If the outside employee notices anything suspicious or does not see the all-clear signal in a reasonable period of time, he/she will immediately call 911 and then call the company's security department. Upon entering the facility, the inside employee will relock the front door and disarm the premise alarm system. If the employee is threatened while disarming the system, he/she will enter a duress code into the alarm system keypad. After disarming the premise alarm system, the employee will walk around the premise to look for signs of intruders or forced entry. The employee will pay special attention to restrooms, offices, and other areas where an intruder may hide. If an intruder is suspected, or a sign of forced entry is noticed, the employee will immediately leave the facility and call 911 and then call the company's security department. After checking the interior of the facility, the inside employee will post the predetermined all-clear signal. The signal must remain visible until all scheduled employees have reported for the day. Safe and vaults should be disarmed at the latest time practical. If an employee is threatened while disarming the vault, he/she will enter a duress code into the alarm system keypad. The front door will remain locked until opening time. Before opening for business, all camera views will be checked to make sure cameras are aimed properly. The DVR will also be checked to verify that it is recording. Any problems with the cameras or DVR will be reported to the security department immediately. At closing time, one employee will lock the customer entry door(s) from the inside. An employee will be stationed at the front door to let any customers remaining in the facility out one at a time. Employees should take special notice of any customers that seem to be loitering or intentionally trying to be last in line. Anyone who seems to be intentionally loitering should be reported to the to the manager. No customers will be admitted after the doors have been locked. Any employees attempting to gain entrance must show proper identification. No vendors or service technicians will be allowed access unless they have been given prior authorization. After the final customer has left, and the front door has been locked, one employee will conduct an initial walk-through of the area. Special attention will be paid to restrooms, closets, employee lounge, storage rooms and any areas where individuals may be hiding. One employee will be designated to conduct a final walk-through of the premises before the final closing. At this time, the employee will confirm that all cash, negotiable items and valuables have been properly stored and that all safes and cabinets have been locked. The alarm system controlling the safes and vaults will be armed at this time. Prior to leaving, all lights should be turned off, except for those lights which will allow the lobby to remain visible from the street after hours. Two or more employees will remain in the facility until the final closing. Before leaving, one employee shall arm the premise alarm system and verify that the employee exit door is locked from the outside.